Join the discussion on our forums! Come discuss Spikeridged Steed over in our dedicated Spikeridged Steed discussion topic. Who would have though 16 stats plus Taunt for 6 mana is OP? Cost should be increased to 7 or 8 Mana at the very least. 7 or 8 would be absolutely unplayable. 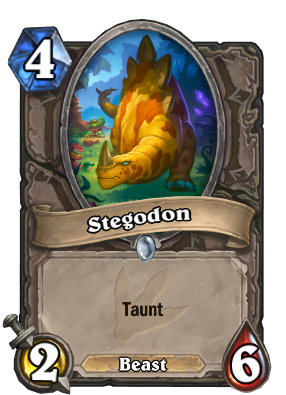 6 mana - Taunt, +2/+6 and summons Stegodon. This card shouldn't be a rare. It should be legendary at LEAST and epic spell! OP card, but surprisingly I don't hate it. I thought this card was OP, but its not quite as good as you think due to its poor stat distribution (rating of Stegodon). What makes it OP however is that it is a taunt that spawns a taunt. It buys you so much time, like the also-offending Stonehill Defender. You thought they learned a lesson with Sludge Belcher. It's 4/12, it's basically Ysera worth of stats in 6 mana card. Op af. The most important part isn't only its stats, it's the "sticky board" effect its deathrattle effect gives. This card is painful to play around in arena. I'm a casual arena player , just play < 20 arena in my entire life and this card manage to get me to 9-3. 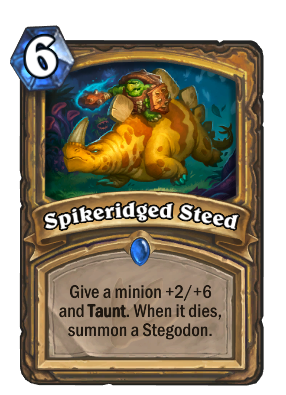 Is it just me or a golden Spikeridged Steed does not spawn a golden stegodon when the minion dies?